Along with Patrisse Cullors and Opal Tometi, Garza created the Black Lives Matter movement in 2013 following the acquittal of George Zimmerman in Florida for the murder of African-American teenager Trayvon Martin. The phrase “Black Lives Matter” is attributed to Garza’s Facebook post in response to the verdict in which she stated “Black people. I love you. I love us. 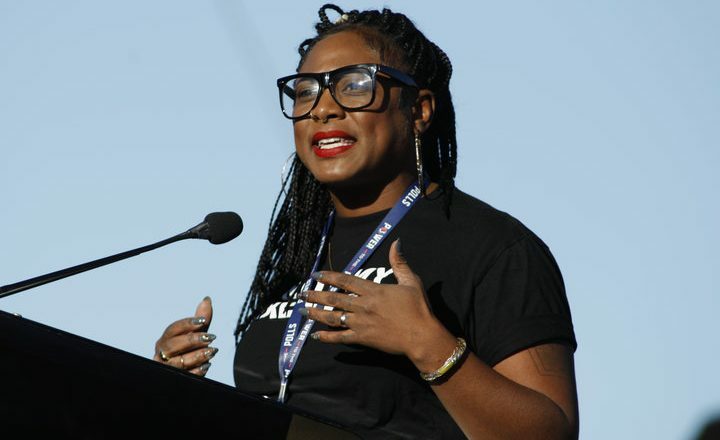 Our lives matter, Black Lives Matter.” Garza is also responsible for the establishment of Black Lives Matter chapters throughout the country as a result of the 2015 Freedom Ride to Ferguson, Missouri that she led protesting the police shooting of Michael Brown. In addition to her activism fighting oppression and violence against Black Americans, Garza organizes for rights for domestic workers and students and issues of health. Dean of Thurgood Marshall College Bernard Anderson stated that Garza’s work is a reflection of the values promoted by Marshall College, which coordinates the Marshall Speaker Series. The Marshall Speaker Series hosts a talk every quarter by an accomplished individual who embodies the college’s philosophy of creating a “more just society.” Past speakers include the son of Thurgood Marshall, former executive editor of the New York Times Bill Keller, and Nobel Laureates Derek Wolcott and Wole Soyinka. The event featuring Garza will be held in the Price Center West Ballroom from 5:00-6:30 p.m.. No admission fee will be charged, but attendees must register in advance through Eventbrite.